Ministry program for children at Harvest Worship Center. This exciting program takes children on interactive adventures while learning about the principles of our faith and God. Currently, our children's ministry is getting prepared to launch to the next stage. We will be doing a super hero style approach. We are currently needing volunteers for both Sunday Mornings and Wednesday nights. If you are looking for a place to serve in the church, then let us know. Please keep this ministry in prayer. 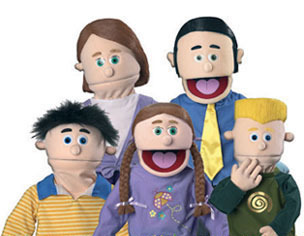 Our puppet friends go with the children on their exciting journeys through biblical history. Each journey has a related craft for the children to show what they learned during their adventure. We give our children an opportunity for praise and worship. It is an exciting time with video music and lights! Children hear familiar songs they can sing to with ease.